If you like learning about the underlying structures that shape the physical, economic and political landscape of our country since day one, then I have a book for you: Common Landscape of America, 1580 to 1845 by John Stilgoe. As alluded to in an earlier post, the book provides timeless insight into the collisions of culture that continue to shape the contemporary American experience, right up to yesterday's 2013 Presidential Inauguration Ceremony, and, I dare say, the most recent TV or newspaper story you watched or read today. John Stilgoe's Common Landscape of America, 1580 to 1845, is a classic book and required reading of all first year students at the Harvard Graduate School of Design. 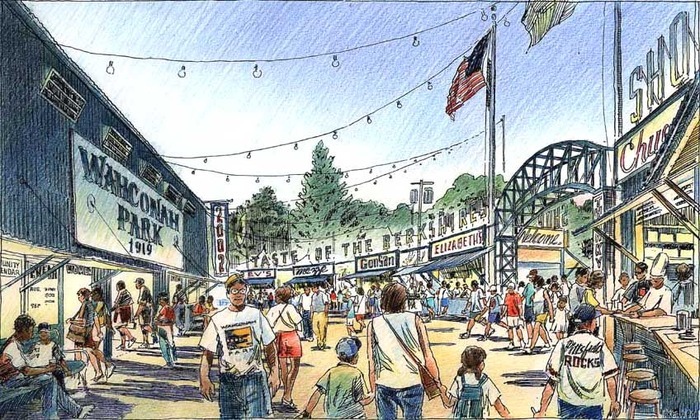 The proposed future promenade of the renovated stadium. Come on, how cool would that have been?